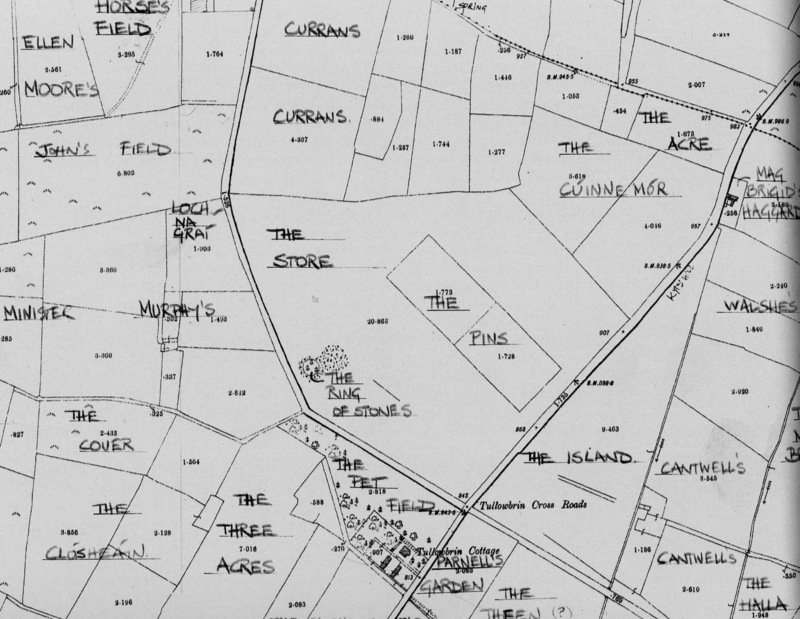 The Kilkenny Field Name Recording Project. THE BOOK: “Townlands: a habitation”. Our landscape is steeped in history and for local communities it is local history that makes their place unique in the world. A generation ago people knew their landscape far better than they do today and every hill and hollow had its name. Many of these names offered windows onto the landscape and into the lives of those who have lived here before us. Today they are rapidly disappearing from our conversations and our memories to be replaced by mathematical formats that identify each farm’s pastures and grazing blocks numerically in departmental registers; Pasture 1, Meadow 2, etc. The Field Over the Wood, The Rotten Field, Molly’s Acre, The Pin Cushion, An Caitheamh Siar, An Seabhac, Drom Riach, Páirc an Úill. The old names marked not only personal territory and family property but also the ancient landmarks and monuments of our ancestors. Some of these names are generations old and tell us as much about ourselves as about our families and communities, each name like a stitch that holds the fabric of our history together. When the stitches are broken, the fabric unravels. Acragar, Agha, Aharney, Annaleck Upper, Annaleck Lower, Archerstown, Aughkiletaun, Balllincrea, Ballinlammy, Ballycabus, Ballyconra, Ballygowney, Ballyhobuck, Ballyhomuck, Ballylehaun, Ballyrahan, Ballyreddy, Ballyring Upper, Blackwood, Boherkyle, Carrigeen, Clone, Clontubrid, Coolatogher, Coolbricken, Coolcashin, Coolnabrone, Courtnabohilla, Cramersgrove, Curraghlane Lower, Curraghlane Upper, Davidsctown, Farnoge, Farnoge East, Farnoge West, Fiddaun Upper, Fiddaun Lower, Firoda Upper, Gaulstown (CP: Muckalee), Gaulstown (CP: Gaulskill),Glencoum, Glenmagoo, Gorteen, Gorteenamuck, Graigueswood, Grange, Grogan, Grove, Inchbeg, Inchmore, Johnswell, Kiltown, Knockbrack, Knocknew, Leapstown, Lisdowney, Lodge Demesne East, Lodge Demesne West, Moneenaun, Mount Loftus, Mount Nugent Upper, Mount Nugent Lower, Parksgrove, Pollagh, Powerstown East, Raheenakill, Rathbeagh, Rathinure, Rathnasmolagh, Rathpatrick, Redgap, Sandsfordscourt, Seskin Little, Seskin North, Seskin South, Stakally, Sweethill, Tifeaghna Browne, Tifeaghna Mount Garrett, Tincouse, Tinnakeenly, Tinnislatty, Tomnahaha, Tullabrin, and Tullaghought. 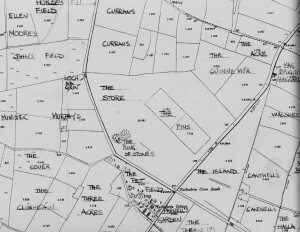 In 2014 The Kilkenny Fieldnames Recording Project is working with eight more community groups who have researched and recorded the field names of 56 more townlands throughout the county. A further thirty townlands are in the process of being surveyed. How to complete the Survey Forms. The Farm Survey Envelope contents and how to source and print : survey forms, aerial photos of your landscape. As additional assistance to participants we have provided an illustrated Online Tutorial Support document which offers a step-by-step guide to the subjects covered in the tutorial and offers other simple alternative methods to view and print maps and aerial photos. This will be particularly useful to those who wish to resource additional maps for their project. Other sections include more simplified information on recording grid co-ordinates and on how to view previously recorded Sites and Monuments in your landscape. This project is an action of the Kilkenny Heritage Plan and is co-ordinated by the Heritage Office of Kilkenny County Council with co-funding from the Heritage Council.